If you’re local, and like the rock & roll, chances are you have caught an Everest show or two. And even if you’re not, with the band frequently touring with likes of Neil Young and Wilco, you very well may have seen them live. The band’s sophomore album, On Approach, was just released May 11 on Warner Bros/Vapor Records. Everest is a band with a sense of history; both an acknowledgment and incorporation of those who came before; something that was no more evident than the last time we caught up with the band: Joel Graves reflecting on his favorite (lesser known) tracks in the Neil Young catalog. Today we catch up with Elijah Thomson as he riffs on his favorite Richard Swift moments.. In addition to playing bass in Everest, Thomson has worked on several of Swift’s records handling engineering and mixing duties as well as playing bass. And if you visit here often, you know we love some Swift. 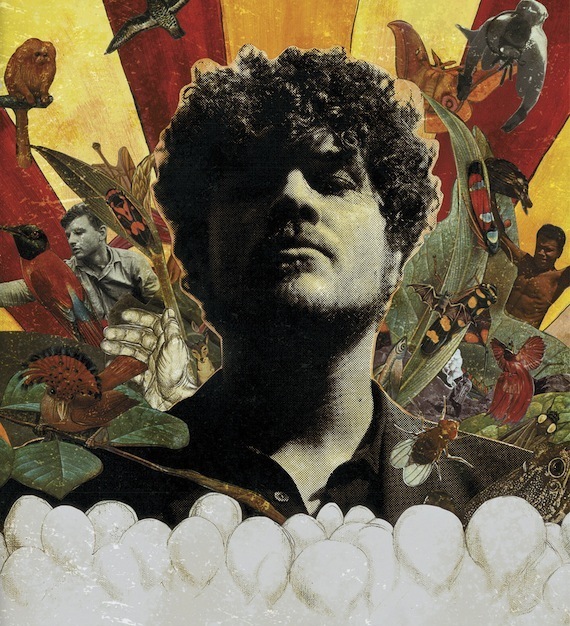 I first met Richard Swift a little over ten years ago, in a swanky cliff-top recording studio perched above the crystalline waters of Dana Point, California. I eagerly anticipated our meeting because I had been hearing stories from trusted sources about this Oregonian wunderkind who many seemed to think would somehow become my instant comrade. I was skeptical; according to my nature. Of course, my propensity to doubt was completely unfounded… Indeed, I was profoundly impressed by his musicianship and vocal prowess but beyond that, I thought he was one of the coolest and wittiest dudes I had ever met. Back then, Richard didn’t have an afro or a blazer. He hadn’t yet been dragged through the mire of adult-life (at least, not to the extent that he has now). He hadn’t recorded The Novelist or Walking Without Effort or Instruments Of Science and Technology or any of the multitudinous jams under his myriad monikers. He was a decent musician with scary potential. A capability so promising, that neither me, nor any one of my talented musical peers wanted to freely admit how in awe we were of it. I wish I could convey to you what it is like witnessing a slightly younger friend and peer, rise from mere musical decency, into being one of the most prolific and inspired artists I have had the pleasure to know and work with over my 35 years of life. At once, it is both humbling and motivating. Beyond that, I’d have to write a novel about it. So I’ve compiled a list of ten songs that are personal favorites of mine from his varying aliases over the last few years. I hope that they will reveal the wide musical scope that represents this individual, yet chameleonic man. What’s more, I truly believe he’s just getting started. “Lovely Night” from The Novelist :: The Novelist was the record that completely sold me on Swift. I was impressed by his foresight and vision; not only sonically (it sounds somewhat like it’s being played through a Victrola circa 1938), but also the emotional landscapes he was able to paint in such a succinct offering, clocking in at nineteen minutes and thirty-eight seconds (get it? “Holiday in 19:38?”) The horn players on this song can frequently be heard and seen in the New Orleans Square at Disneyland. “Buildings In America” from Dressed Up For The Letdown :: This is probably my all time favorite Swift jam. On one occasion, Swift and I made a 5.1 surround sound mix of this song, that was probably the single most awesome sounding thing I’ve ever heard in the studio. We had never tried anything in surround, and we went hyper-psychedelic on it, automating things to fly all around the 360 º perspective. I’m sorry that only I, and the few people who were there that night, know what you’re missing. “The Ballad Of You Know Who” from Dressed Up For The Letdown :: Also, from Dressed Up For The Letdown, this jam highlights Swift’s use of restraint in musical production. The instrumentation consists of simply piano, drums, bass, and a three-piece string ensemble. My favorite memory about this one was watching Swift, not only sing his melodic ideas to the first-chair L.A. Philharmonic dudes (who then transcribed what he had sung to paper), but then watching him conduct them rhythmically, as if he had ever conducted a string ensemble before. These guys didn’t flinch, and were seemingly grateful to be able to play on such a beautiful song. “The End Of An Age” from The Atlantic Ocean :: I didn’t work on this record, so the first time I had heard this track was in Swift’s studio in Oregon. He played it all the way through on the acetate master. Most of the songs I had heard before, since a majority of that record had been written years prior, but this one was new, and it nearly drove me to tears. His ear for clever chord changes and beautiful melody had risen in my mind to a super-elite level, occupied only by McCartney and a select few others. “Ghosts Of Hip Hop (New Apostles Mix)” from Music From the Films of R/Swift :: Instruments of Science and Technology is an electronic side project developed in the interim between the recording of The Novelist and Dressed Up For The Letdown. I think he uses these side projects in many ways to polish other, more abstract areas of his production and songwriting skills. This one sounds to me like an old dub jam hacked to shreds by DJ Shadow. “The Bully” from Ground Trouble Jaw :: Recorded exclusively on either four-track cassette or eight track one-inch analog tape, Swifts sarcasm and humor is really showcased. I mentioned this above, but Swift could seriously lead an alternate life as a satirical humorist. Sylvie Lewis — “Conversation Piece” from Tangos and Tantrums :: This song was written by another great, yet relatively unknown singer/songwriter named Sylvie Lewis. Swift produced her debut record, with Lenz and myself helping out where needed. Conversation Piece is a true duet between Lewis and Swift, and is actually one of my favorite vocal performances of Swift’s. I hope you like it. Buy Sylvie’s records too! This is such a nicely written piece and great bit of insight into the humbling Swift catalog. Hands down, one of the most talented, versatile and criminally underrated songwriters around. Fact. Eli is a relentless poet. Well done, fellas. Swift is the bomb…no questions asked…will everyone else figure it out? I saw him in Cleveland during a blizzard, and there was only about 10 people at the Beachland Ballroom. He gave it all he had, when he probably didn’t want to or have to. It was crap outside. he’s good, really good. I was never a fan of his solo work but what he added to groups like SF59 and Black Keys was truly amazing. RIP.